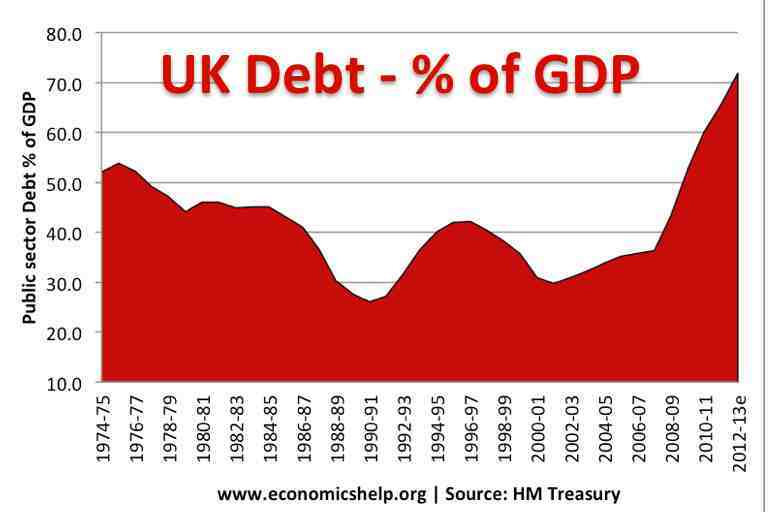 UK government debt is around £1 trillion, equal to over 70% of our GDP, and way above highest levels since 1975. It is continuing to rise fast, and many people are worried about it. But here are some interesting facts. 1) Without repaying a single pound, up to £54 billion has been wiped out by inflation every year. When inflation (RPI) rose above 5% recently, savers were earning less on their government bonds than they were losing from inflation. The difference was money that went into the pocket of the government. 5% of £1 trillion is £50 billion - the amount by which government debt reduced in real terms. Compare that with the increase in government debt in 2012 - likely to be around £120-130 billion, and you can see the significance. Inflation robs savers and wipes out debts, which is very convenient if you are the government, and looking for ways to take more from wealthy without raising tax rates. That is one reason why, as I predicted 2-3 years ago, we can expect that the Bank of England will be quietly relaxed about letting inflation continue, month after month, year after year, running 1% or 2% or even 3% above the official inflation target of just 2%. At the same time we can expect the Bank of England to continue to make the usual protestations about “short term inflationary factors”, “unusual circumstances”, to keep the markets reassured that inflation will not spiral out of control. 2) The simplest way to raise money if you are the government, to repay savers, or to pay salaries of government employees, is to print more cash. In the old days that meant literally printing more bank notes, but in a digital world, such economic tricks can be carried out at the speed of light with a single click on a computer spreadsheet. And the simplest way to obscure the reality of what you are doing is to create digital money, and spend it straight away buying up your own government bonds. That is exactly what the UK has done on a massive scale, making enough digital money to buy a third of our entire national debt. More money slushing around the country, chasing the same amount of goods and services, stimulating demand, and keeping prices higher than they would be otherwise. It is a fine balance, trying to prevent price falls and trying to prevent over-stimulation and high inflation. Deflation can be a terrible curse: assets such as homes, factories and hotels rapidly fall below the value of the loans on them, people stop bothering to repay mortgages and declare bankruptcy, banks are left with loads of bad debts. It is hard to know what would have happened without the stimulus, but it is a fact that the UK has had a much milder downturn than many experts would have expected, given the global banking crisis and that so much of the UK economy is tied to banks. As we have seen in 1), a little extra inflation can also be a very helpful way to wipe out debts, not only of government, but also of ordinary people, who may be paying less on their mortgages in interest than inflation – ie they are actually being paid to borrow. 3) Despite much talk of aggressive government cuts and tax rises, the truth is that all that is happening is that the government is moving closer to the day when it lives within its means. But that day is still some years away. Until that time, UK debt will continue to rise. 4) Most UK debt is not due for renewal for a while, and is on fixed "reasonable" terms which were set well before the financial crisis, with quite low interest rates compared to what many nations are being forced to pay today across the EU. Even better, because the markets have taken fright at the mess in Greece, Spain, Portugal and Italy, they have been rushing to buy UK bonds, for almost no financial reward other than being able to sleep at night in the belief that their money will be (almost certainly) safe. - and buy more of its own bonds. That is why investors feel relatively secure. They can see that UK inflation might rise (which would slowly erode the value of their savings), but they cannot see a situation where the government would suddenly announce that it was refusing to pay interest or to refund savings. - and no government will risk taking any sudden action that would risk economic growth. 7) The impact of this whole process has so far been gradual and is likely to continue that way. As a nation we will adjust to less public spending, and relying more on the efforts of private individuals to make up the gaps – whether paying for additional health care privately, or extra tuition fees and so on. What are your own views? Do comment below. I reply to each one.